Smart Motorways are commonly being implemented more and more often throughout the UK as motorways up and down the country are upgrading. The first Smart Motorway emerged in 2006 on the M42 in the West Midlands. There are now over 20 smart motorways in the UK, with 10 or more being planned between the time of writing and 2025. When was the first time you heard of a smart motorway? 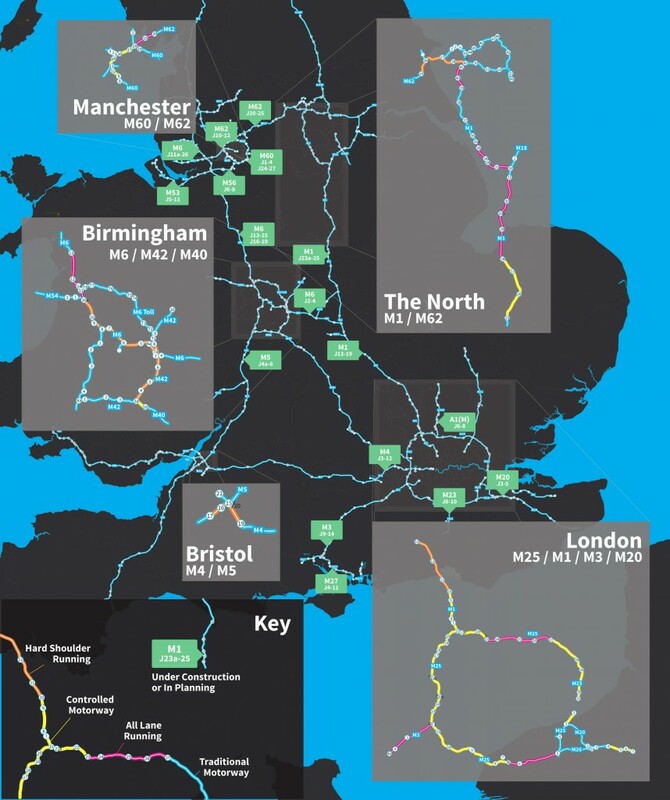 Highways England are the ones responsible for planning, building and managing Smart Motorways. Although there are different types of smart motorways, the key difference between smart motorways and non-smart motorways is the active traffic management (ATM) or what many of us would know it as variable speed limiting. The other feature of a smart motorway which can differ from one to another is the use of the hard shoulder, which could be used all of the time or opening at busy periods to ease congestion. There are also a number of smart motorways under construction which are parts of the M1 (J13-J16, J23a-J25), M4 (J3-J12), M6 (J2-J4, J13-J15, J16-J19), M23 (J8-J10) and M27 (J4-J11). What is the purpose of smart motorways? The purpose of a smart motorway is simply to ease congestion, traffic, make them more environmentally friendly and to make motorways safer for ALL drivers. This is done by adding a variable speed limit which aids in reducing congestion - (cars speeding and then stopping can lead to congestion). Another way smart motorways aid traffic is by strategically opening and closing the hard shoulder to increase the volume of cars that the motorway can handle. One of the biggest criticisms when it comes to the smart motorways is the use (or lack of) of the hard shoulder. An example of an incident which went wrong on one of these modern motorways was covered in the Daily Mail when a driver's vehicle broke down while the hard shoulder was active as a lane, leaving them stranded on an active motorway lane. Although most, if not all, of the accidents reported in the article, was ultimately due because of driver error; it does beg the question "what should those who have broken down do if there's nowhere to go?" There are some emergency refuge areas on these motorways but they are not always at a convenient location. The second biggest criticism of smart motorways is the large increase of fines people have received following their construction. While it is busy and the ATM is working it's magic it is understandable, however, many drivers have reported receiving fines for going under 70mph when the road was perfectly clear. Many people believe this to be a little greedy and how the motorway controllers are slow to react when the motorway is not currently having any issues, while others highlight how the driver could have avoided the fine completely by simply following the rules of the motorway. The Express have covered this in this article. What do you think of smart motorways at the moment? Please let us know in the comments section down below. Smart motorways are here to stay for better, or for worse. Many people feel that even though smart motorways do have their drawbacks, it is still a sign that Highways England is keen to make changes to attempt to improve the massive traffic problem we have in the UK. Who knows what the future holds in terms of these motorways... and perhaps these changes are just first in line for many improvements... we'll see for decades to come. We'd love to know your thoughts on this - please let us know if you've already been affected down the comments below!